Brighouse v Tadcaster Albion. Tom Haigh scored one goal and made another. Brighouse Town maintained their promotion drive in Evo-Stik NPL East with a 3-0 home win over top-five rivals Tadcaster Albion yesterday. They closed the gap on leaders Morpeth, who were held 1-1 at Pickering, to four points but the other teams chasing second-placed Town all won. Adam Field (knee injury) was a late withdrawal for Brighouse, who were already without Tom Robinson. Albion had the benefit of an easing wind in the first half but found Kurt Harris and James Hurtley in commanding form at the back and Adam Jones moved the ball away well to midfield. Several players were booked in a hard-fought opening 45 minutes but Brighouse’s goal was rarely threatened and the confident home side settled down to play some good football in the second half. Haigh cut in from the left and beat experienced ex-Sunderland keeper Michael Ingham with a firm left-foot shot on 53 minutes. Gabriel Johnson and Haigh set up leading scorer Martin to rifle home the second via the under side of the bar on 75 minutes and Heeley thundered home a third from 12 yards with 10 minutes left. Town travel to next-to-bottom Stocksbridge Park Steels next Saturday. 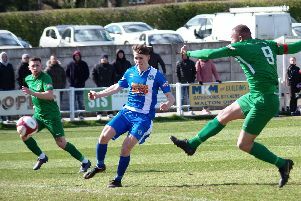 The Sheffield side are reeling after a 5-0 home defeat to third-placed Pontefract Collieries yesterday.